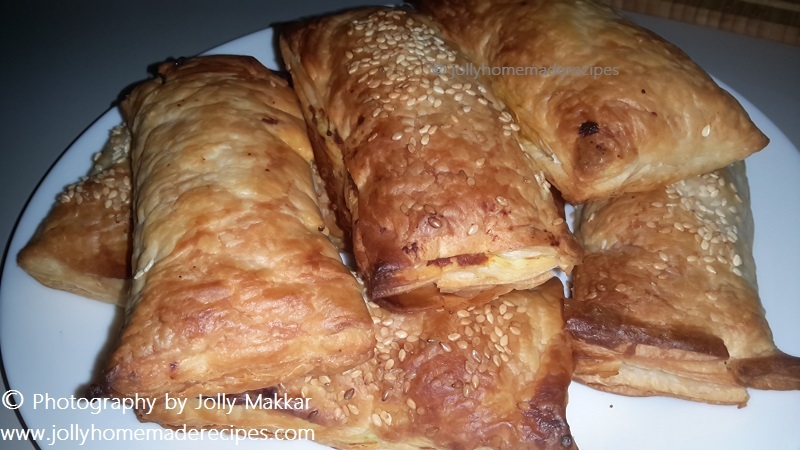 Potato Puff Pastry with step by step recipe - These delicious savory appetizer pastries filled with full of yummy mashed potatoes. It is easy to make. They are airy, light and just so tasty. It was not hard to eat them all! 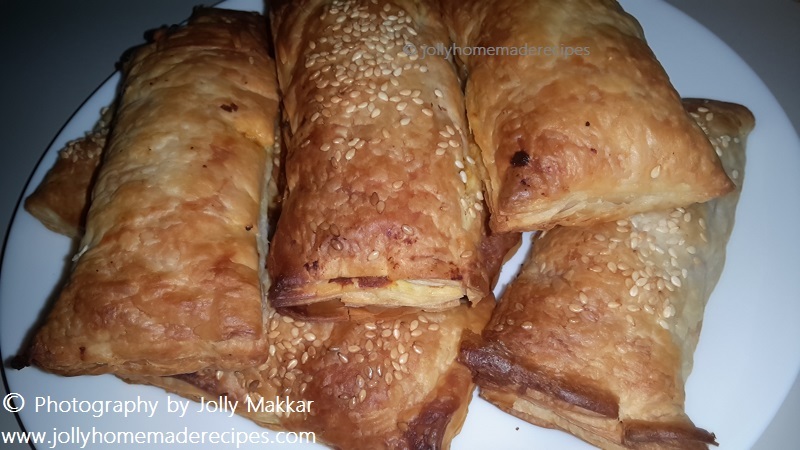 This is one of my favorite pastries which is attached with my school time memories. That time we called "Potato Patties". One of my friend first introduced me to it and I get it interval time, I'll make sure it's available at the canteen. At interval time, after finished our lunch, me and my friend will specially go to canteen to have this on a regular basis or if its skip at school time, will have at after our evening tuition :D Beautiful memories of school days and especially with food :) Let's go to the post !! While most of the breads & cakes are quite complicated for me :D and take lot of time, this pastry is something I can easily create at home. 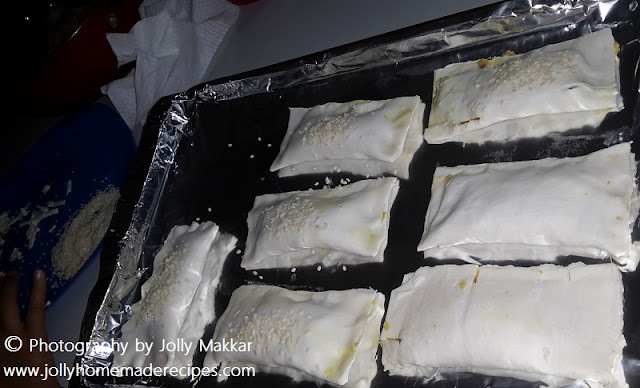 Pastries sheets are easily available in every shop in Australia but in India specially Bangalore, I was searched so many places and online website too, to get puff pastry sheet, but can't get anywhere these pastry sheets. 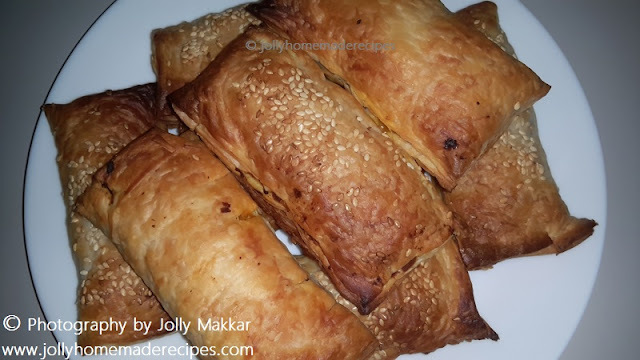 It’s basically a puff pastry, filled with simple cooked potato in an Indian style and topped with more sesame seeds for more taste, if you don't like sesame seeds you can skip this. I used potato filling you can customize your own preference of filling. You can customize their shapes also. 1) Mix the flour and salt together in a large bowl. Gradually stir in water until the dough holds together enough to clean the sides of the bowl. Shape into a flat ball, and allow resting for at least 8 to 10 minutes. 2) Place the butter between two pieces of plastic wrap and pound into a flat disc using a rolling pin or other heavy object. Refrigerate until firm, about 15 minutes. 3) Spread a plastic wrap and place the dough over it. Cover with another plastic wrap and roll it into thin sheets. Now fold them from both ends and invert them and roll it again into thin rectangle. Fold them from both ends. Cover this with plastic wrap and put them into fridge for 30 mins. 4) On a lightly floured surface, roll out the dough into a large rectangle about 1/2 inch thick. Place 1/4 of crumbled butter (chilled) in the center and fold the two ends over it so that it is completely encased in dough. 5) Roll out the dough again, taking care not to let the fat break through the dough, to about 1/2 inch thickness. Fold into thirds. This is the first ''turn''. Rotate the dough 90 degrees and roll out into a rectangle again. 6) Fold into thirds i.e. 2nd turn. By this time the fat is starting to warm up. Wrap in plastic and refrigerate for at least 10 minutes. 7) Repeat this rolling, folding and turning one more time with butter and then without butter. Wrap and refrigerate. The dough is now ready to roll out and use in any recipe calling for puff pastry. 8) Roll the dough out as thin as 1/4 inch to make pastries into a large rectangle/ square shape. Freeze them and use it when you required and make sure parch the baking sheet in between every pastry sheet so it can be easily come out. 1. Defrost puff pastry sheets until they are soft enough to work with. 2. Preheat oven to 400F. Line 2 baking sheets with baking mats or parchment paper. 3. 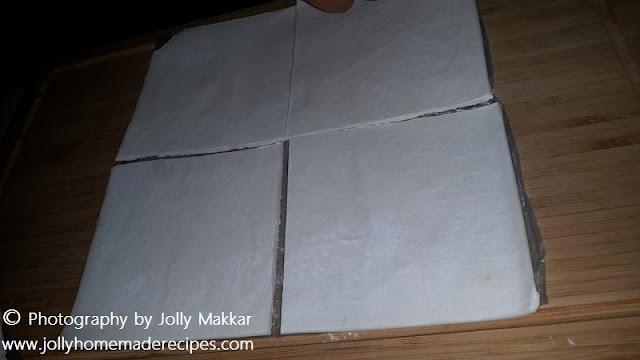 Remove frozen parchment paper from the puff pastry sheets. 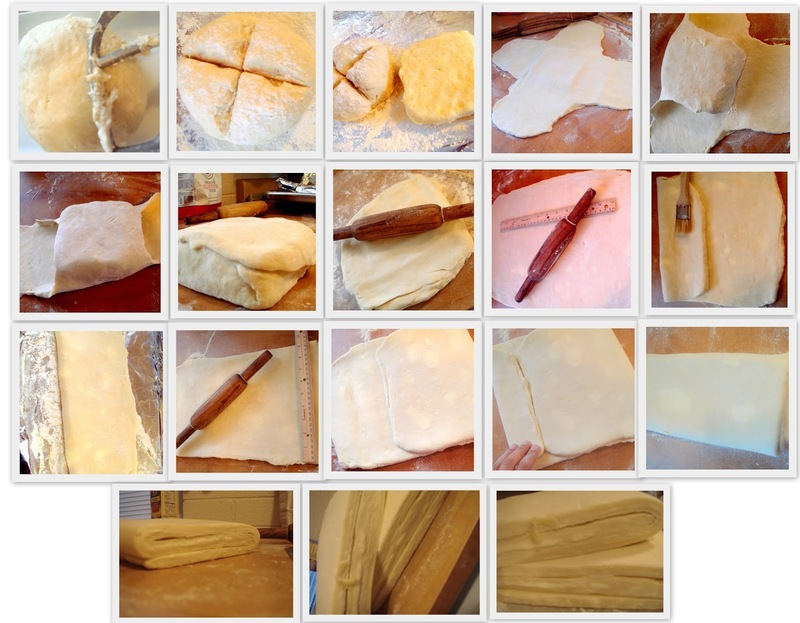 Using a sharp knife, slice the sheets along the folds, forming 4 long squares per sheet (see photos below). 4. 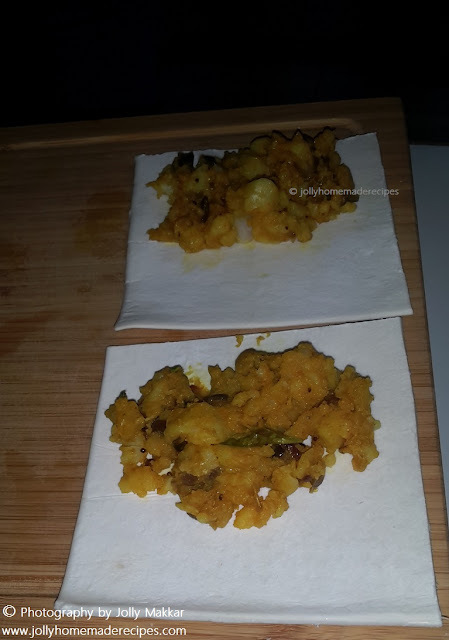 For every pair of squares, take about 1 to 2 tbsp mashed cooked potato and put into the center of it. 5. Wet the edges with water so that it would stick while folding. Fold the puff pastry sheet towards you, as shown in the pic. Seal the edges by pressing with your thumb. Repeat with remaining puff pastry. 6. Brush the top with water, which will give the puff a bright brown after baking(you can use egg or oil or butter wash for brushing, but I didn't used it). Sprinkle some sesame seeds on top. 7. Place into oven to bake. Bake for about 15 to 20 minutes or until pastries puff up and turn a golden brown(mine will done in 15 minutes). Let pastries cool a few minutes before serving. Note** : Check at regular intervals to avoid burnt puffs. 8. Serve puff pastry with your choice of sauce. I just love this recipe. 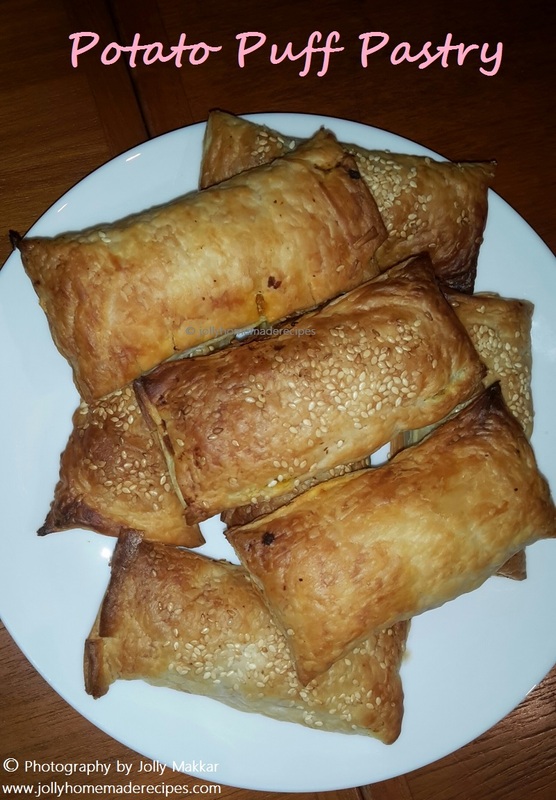 Nice and tasty Potato Puff Pastry. 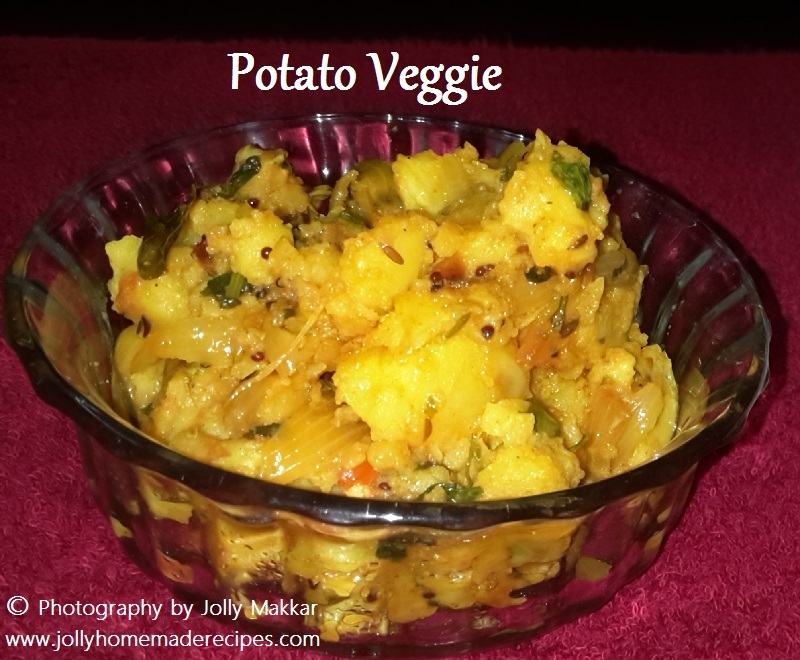 Very well explained recipe. Good share dear Jolly. Love the step by step pics. Very detailed and great share. Who doesn't love potato stuffed pastries! I am drooling, Jolly. How I wish I could have at least 4-5 of these right away! SO YUM! Bookmarked the recipe Jolly! 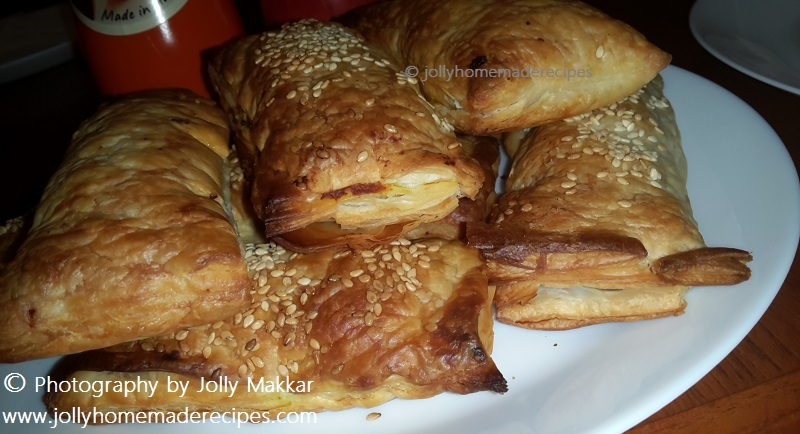 A tasty puffed pastry recipe share dear! And thanks for sharing the detailed step by step for the pastry sheets too. Thank you so much dear, glad you liked it. 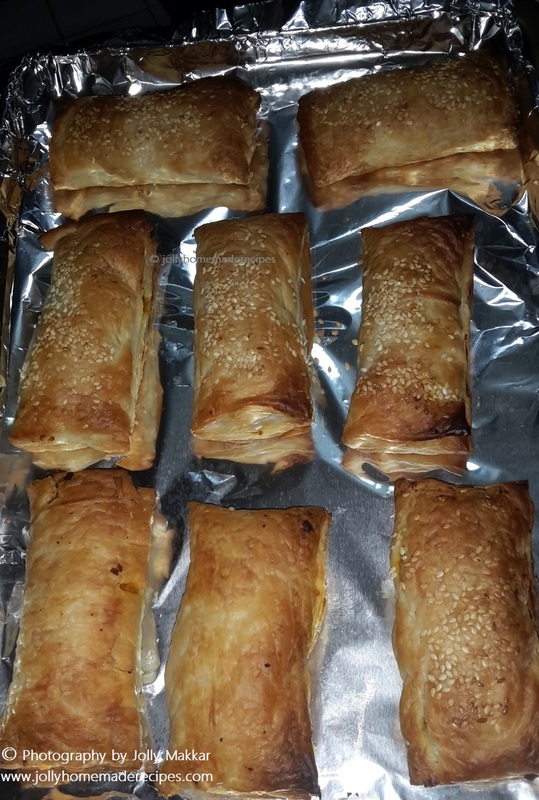 lovely puff pastry, love them stuffed with all sorts of vegetables, and also cheese. Very well explained Jolly. Wow.They look really awesome and your site has lovely recipes. Thanks a lot Shobana, glad you liked my recipes. Cant believe it is homemade.. Awesome Share ! !